Howcrofts is an unassuming Off Licence come Grocers with a big claim to fame. The shop has opened daily for the past 63 years! Sundays, Bank Holidays, Christmas or New Year, every day for at least for a few hours. 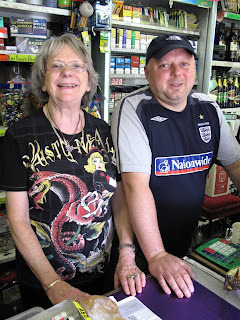 Maureen Vickers, her son Noel [pictured here], and husband Robert, have served behind this counter for much of their lives, fetching what the customer wants from the shelves that stock that little bit of everything people might need. It’s not self-service. You ask for a tin of tuna and they get it for you. They don’t make a fuss or draw attention to themselves. Just open daily, stay open late and stock what local people need to buy. “There’s always a bottle of champagne in the fridge”, as Maureen says, “we never know when someone’s going to need it nice and cold for a celebration”. They continue the work started by her father, Wilfred Howcroft, who began running the shop in 1947 and moved his family into the adjoining house, when Maureen was five. Back then, the shop was owned by John Smiths Brewery (and later by Courage) and sold beer, sherry and port on tap. Locals would bring their own jugs to be filled and take home. They also sold powdered eggs, sugar and flour from huge tubs as well as butter, lard and cheese, sold by weight from slabs. With no refrigerator, dried meats hung from hooks, which remain in the ceiling. Noel showed us this well-thumbed photo from the 1950s, of his grandfather standing outside the shop. You can just make out the cigarette vending machine on the wall and the free-standing sweet machine. “There’s no way you could have those outside now.” says Noel. Some other things have changed too. Now the family own the building and the business. They removed the draught pumps about 20 years ago, but have kept them in the garage, along with the old John Smiths magnet sign. All stock used to be delivered, but now they buy everything from Sheffield’s Cash’n’Carrys. The shop’s now decorated with Maureen’s eclectic collection of witch paraphernalia – some dolls cackle when you clap your hands – and there’s even a fairy-light spider’s web on the outside of the building, which they switch on at night. There used to be other shops nearby – a butcher and so on – but they’ve closed down and become residential. No doubt that private ownership has helped them stay in business, but Maureen and Noel think their longevity is down to staying open till 11pm and knowing what people want. They’ll stock a particular brand of fags or a certain type of martini, especially for customers who ask. Living near the shop means their customers are neighbours and friends. And it doesn’t take too long to get to know more recent arrivals. Customers seem to respect what they do, so they don’t get any trouble. They’ve seen generations grow up and some of the kids that used to buy sweets are now grandparents, alongside Maureen herself. Now you’ll find her grandchildren picking items off the shelves and playing shop. The family have every intention of improving on their 63-year run.